Wednesday 26 February, 2 -4pm @ The University of Roehampton is open to all. For further details and to sign up, please click here. Adam Foulds, named as one of Granta’s ‘Best of Young British Novelists’ will host his first masterclass at the University of Roehampton, where he is a lecturer. The masterclass: “Inventing People – Creating Characters for Fiction” will be held on Wednesday 26 February. Adam’s work has been showered with praise from the outset of his career. His first novel, The Truth About These Strange Times (2007), won the 2007 Betty Trask Award and 2008 Sunday Times Young Writer of the Year Award. He joined the University of Roehampton in 2012 and was immediately whisked off by the British Council on a year-long worldwide tour to support the Grant list. He received the E.M. Forster Award from the American Academy of Arts and Letters in 2013. 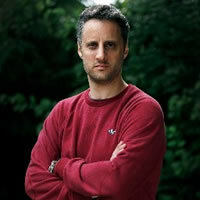 Adam Foulds is one of a number of internationally acclaimed writers and poets in the Department of English and Creative Writing at the University of Roehampton. His colleagues include Dame Jacqueline Wilson, Fiona Sampson, Iain Sinclair and David Harsent – who will give his own masterclass: ‘Song Lyrics - Do it your way’ on Monday 24 February. Following his masterclass, Adam will give his first public reading from his new book - In the Wolf’s Mouth (published in hardback on February 6 2014 by Jonathan Cape) – at a special Department of English and Creative Writing book launch event. This event will showcase some of the talent that the Department contains and will celebrate their Department as a whole’s creative output in 2013 when 13 books were published. Adam, pictured right, said: “I am delighted to be part of such a vibrant and diverse creative writing department. There is such a broad range of writing styles at Roehampton and I am excited to help students develop their skills. A masterclass is an interactive teaching event, but with the energy and excitement of a music concert. They are a great chance for people to meet and interact with interesting writers and you don’t need to be a creative writing student to participate”.